Suzy Lee, our Book Artist for March-April. Click on the image to be taken to the websource. Thank you very much Suzy for agreeing to be both our Author/Illustrator for our Bimonthly theme: “When Words are not Enough – A Wordless PictureBook Special” this March-April 2011. Truth be told, when Mary saw your website and I noted that you are now based here in Singapore, we knew that you were the perfect Author/Illustrator for our theme. We are truly very excited to have you here in our pages. Suzy, being an internationally–recognized and awarded artist has been interviewed in two of our favorite Websites: PaperTigers and 7Impossible Things before Breakfast – so we would try as much as we can to put a different twist to our set of questions here so that you can still refer to their interviews and check ours with very few duplication. Your website indicates that you are currently working and based here in Singapore, could you share with us the nature of your work here? I came to Singapore in 2006 because of my husband’s job here. Life brings us always to an unexpected spot—I remember when I arrived Singapore and felt the smell of tropical for the first time- something I’ve never experienced before. Since then, I am enjoying my life and work here. I am working as a half-time book artist, a half-time mom with two kids. What is the best food that you have tasted so far in this country? Laksa! Check on the image to be taken to the websource. My favorite one changes every day. 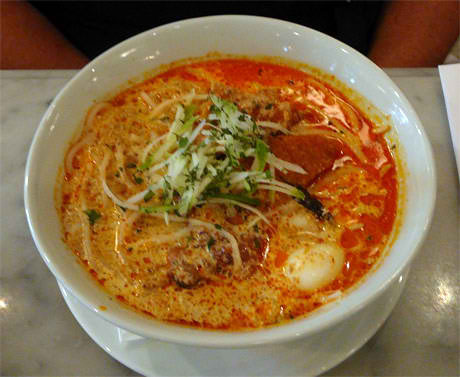 I had Yong Tao fu Laksa yesterday and it was marvelous. Children usually get compliments when they make any art, don’t they? – and I was the child who ‘really’ believed in those compliments and decided to become an artist. I’ve been doing drawings since then, all my life. Could you share with us how you were like as a child? How were your obvious talents in the arts developed at home? I am not sure I was that talented when I was a child. (If I look at the early drawings, they don’t seem to be extraordinary at all.) My parents were not professional artists at home, but always lots of books were around, music was on all the time. They encourage me a lot whatever I did. 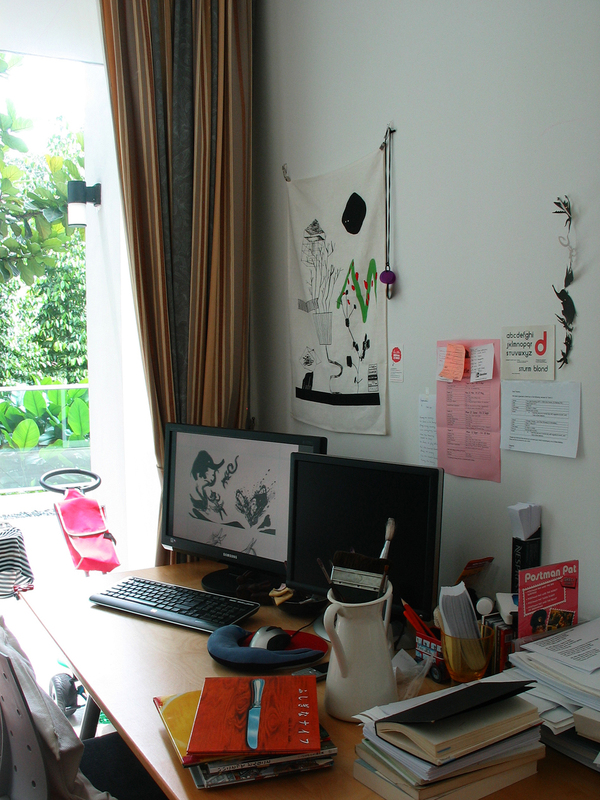 My Bright Atelier from Suzy Lee's Website - click on the image to be taken to the websource. 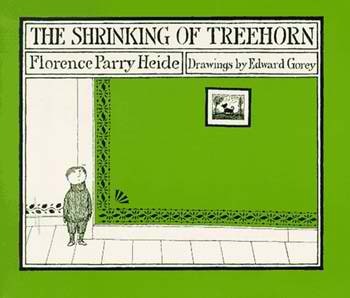 You mentioned in the 7Imp interview that one of your favorites as a child was Florence Parry Heide’s The Shrinking of TreeHorn as illustrated by Edward Gorey – I’d like to know were you also exposed to Western-based authors? Who among these authors made an impact on you? and “The Life of Numbers” by Fernando & Maria De La Luz Krahn. I read these books until they were torn apart. As the Gorey’s books gave me a certain feeling of strangeness and solitude, above mentioned books gave me the same feeling that I couldn’t forget. 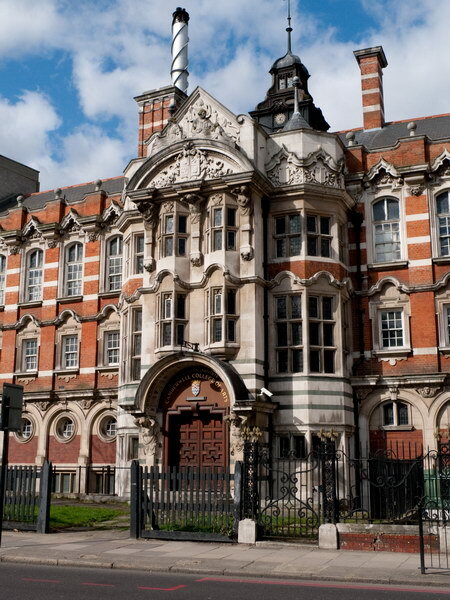 Your website also shows that you received your BFA in painting from Seoul National University and your MA in Book Arts from Camberwell College of Arts in London, tell us what your top three significant learning are from these institutions? 1. You have to find out what you really like and what you really hate. 2. There are two kinds of people: people who pushed forward what you like till the end and who didn’t. 3. Focus on what you have now. Forget about what you didn’t do. I have been influenced by thousands of mentors from everywhere. All different qualities that I learned from them are equally important and became part of my works. In the 7Imp interview, you noted that some of the authors whom you would like to have a cup of coffee with would be Michael Sowa, Shinta Cho, and Maira Kalman. Could you share with us a little bit how you came to know their works? I just happened to get to know them through their books. 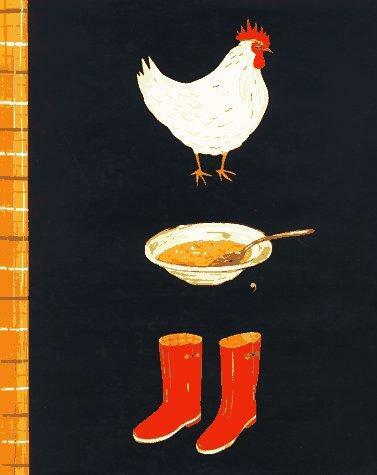 Maira Kalman’ “Chicken Soup, Boots”- her works are easy-going. She unfolds the story in a very easy manner just like her drawing. Chicken Soup, Boots - click on the image to be taken to the websource. 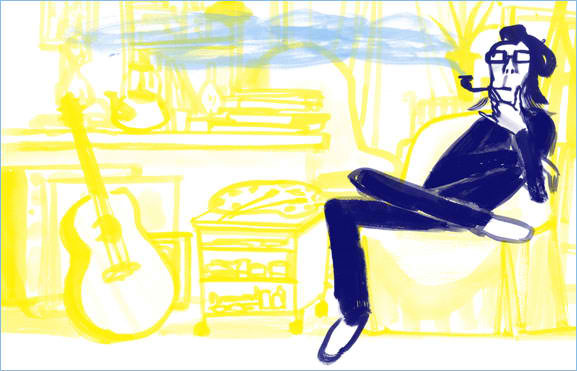 Shinta Cho- I got to know him in a bookshop in Tokyo. Absurd but poignant, strange but funny. Michael Sowa- I thought I found Edward Hopper’s art book but it wasn’t. Sowa’s works are absurd but poignant like Shinta Cho’s books but in a different way. Realistic but dream-like at the same time. Loneliness and humor co-exist in his images. I was fascinated by these bipolar feelings that his works offer. Art materials I use are mostly traditional. Pen, pencil, charcoal, water colors, gauche, acrylic colors, collages, lacquer sprays, printmaking etc. I also use Photoshop. What kind of books I am working on decides the art material. One of my missions in the recent trilogy books- Mirror, Wave and Shadow- was how much I can hide the use of computer. I drew the illustration by my hand but final output was digitally manipulated. Digital pens and inks? If it is about how much closer to the original hand drawing, I would rather draw directly by my hands. Every medium has its own advantages- if I have an intention to push forward the ability of digital drawings, I would certainly use them though. 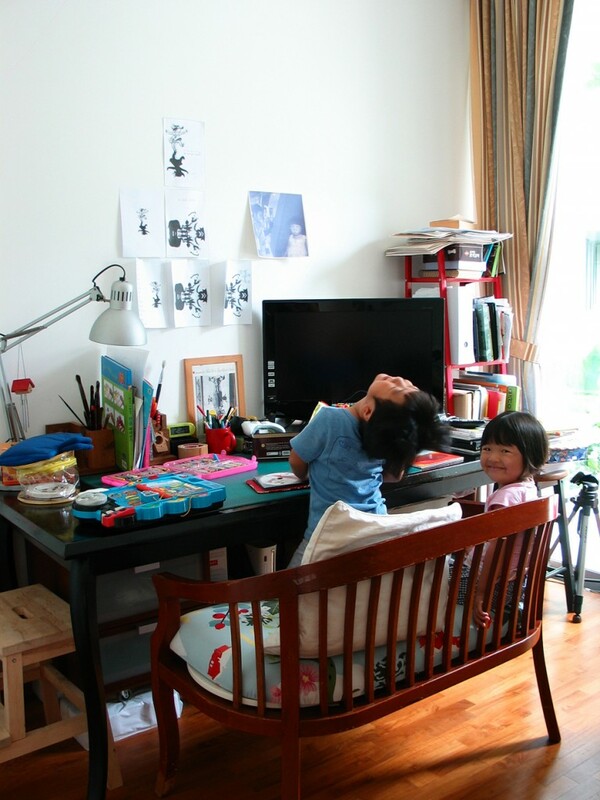 Since you have already shared with 7Imp a few photos of your workstation, I note that the photo was taken sometime 2008, let me just ask how much has it changed now that you have two little children? Would you be able to give us a more recent photo of your workstation now? I have two facing desks in my work room at home. One is for computer work, the other is for drawing. But my kids (4-year-old boy and 2 year-old girl) think those desks are theirs. The real owners of this workstation: Suzy Lee's Kids! I also caught on in two of your interviews that instead of referring to yourself as an author/illustrator, you would rather be called a Book Artist. Tell us a little more about this. In that way, I can feel I am actually involved in a “book”. When I make a book, I see a book as a whole. Every elements of a book linked together, and I’m the organizer under the broaden concepts of art. Almost all of your books deal with girls as protagonists (Wave, Mirror, Alice in Wonderland, Shadow, The Zoo, Blackbird) – any special reason for this? Is this also inspired by your having two children at home? Maybe that girl in my books is myself when I was young or the eternal child in my mind. Or, I should say that it’s simply because I need the flipping “skirts” to show the active movements of the protagonists! In the 7Imp interview, you shared that you used to have exhibitions as a painter and once worked as a freelance illustrator before you became interested in a ‘book’ as a medium when you took your MA in Book Arts in UK. 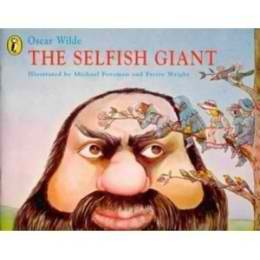 What led you to the path of children’s literature? What sparked your interest? 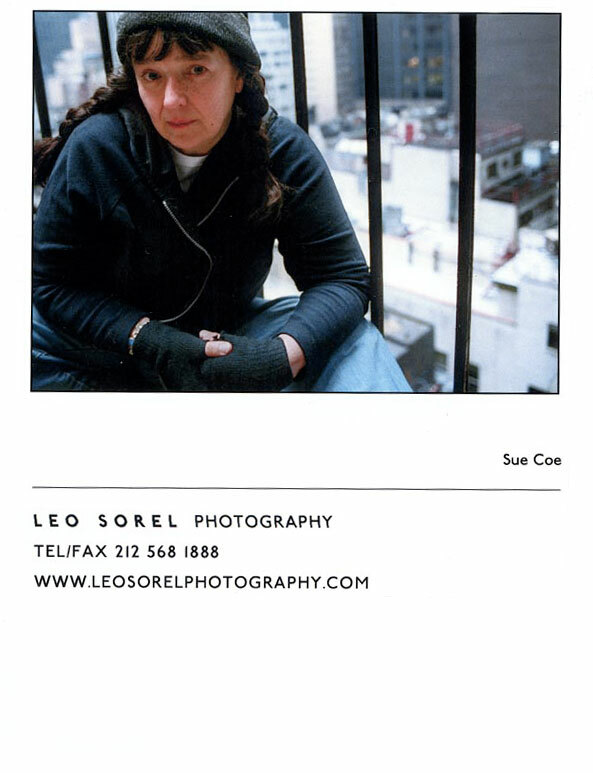 I happened to see Sue Coe’s artist book in my professor’s bookshelves when I was a university student. It was quite shocking that a book can be that powerful medium to carry an artist’s statement. I got to have interest in the book that can develop the story using the power of pictures. Naturally, I moved to the world of picture book. I thought that I saw the very intuition that cannot be simpler and stronger. That was what I’d been looking for. Sue Coe. Click on the image to be taken to the websource. What are the joys of being a book artist for children? I am very lucky to have the most creative readers and reviewers in the world- children. And also, it is such a joyful moment to see when children find something in my books which I found in children. I once found the notes for a bookshop regarding my book “Shadow”. It stated that the key selling point of “Shadow” would be “Accessible enough for even very young children; sophisticated enough for adults”. That was a quite a compliment for me, since that is the most difficult part whenever I make a book. Tell us about your very first published book, Alice in Wonderland in 2002 – how did it come about? What was the feeling like? 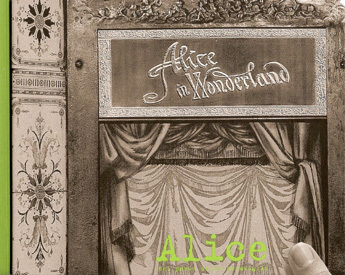 I was in the middle of process of making “Alice in Wonderland” as my MA Book Arts project. I happened to go to Bologna Children’s Book Fair in 2001, and brought the dummy book without any intention to sell it. Then some linking accidents happened- my friend introduced me to “La Trois Ourses” and as soon as they saw my dummy, they brought me right away to the booth of Edizioni Corraini, specialized in artists’ books, to show my project. And the editor liked the dummy, and then published it. Everything’s happened in a blink of time. Bologna was the place this kind of thing actually happens and I was the Alice in wonderland. Did you expect that your books would be as well-received internationally as they are now? Every time I open my book and show it to people, I found that they smiled at the same page, made the similar gesture at the same page. My books were mostly wordless and that might be one of the points we could communicated more easily. It’s fascinating that we’re connected by this universal understanding and unexplainable bond. In the 7Imp interview in 2008 you mentioned working about a girl who wants to be an artist, has this book been published? What are some of the more recent projects that you are currently undertaking? That is “My Bright Atelier”, which I mentioned in the above question. I am currently working on “The Border Trilogy”. It is an essay about my picture books “Mirror”, “Wave” and “Shadow” that commonly share the subject of a “border”. The “border” in the trilogy is the border between fantasy and reality as well as the physical center binding fold of the double spread-page of a book. Through this book, I talk about the esthetics of a book form, the principle of a wordless picture book and an artist’s practical/ philosophical approach towards the picture books. If you are to share with young artists the top three lessons that they could benefit from in terms of book publishing as a trade/industry, what would those 3 life lessons be? I think I could say just one fact. Imagine that your artworks can be affordable, portable, intimate, replicable and universal. What could be better than that? They are the innate qualities of a “book”. Thank you so much Suzy for being a part of our GatheringBooks Wordless Picture Book Special (When Words are not Enough) – I honestly can not get enough of your books. I could not stop staring at the illustrations and just literally drowning in the artwork. Absolutely beautiful. Please watch out for more of our Suzy Lee Special in the next few days where we talk about her latest work Shadow (2010) and Mirror (2008), Wave (2008), La Revanche des Lapins (2003), and my personal favorite Alice in Wonderland (2002). She has also shared with us two of her other books The Zoo (2004) and The Black Bird (2007) which are technically not as ‘wordless’ as the first five books – but we shall still review here in GatheringBooks nonetheless. Watch out for more! For more information about Suzy, please click here to visit her website. Click here to be taken to the Paper Tigers interview in April 2009. Click here to be taken to the 7Impossible Things before Breakfast interview in August 2008. Oh, I can’t wait for your Alice in Wonderland feature ever since you mentioned before that it matches the movie Inception. Great interview by the way. I wonder if you’re going to feature the books of some of the artists that influenced Ms. Suzy Lee? I love that she mentioned Gorey. I own one of his books and it is sort of strange and dark. It has a gothic feel to it. Another author/illustrator we should look into. Right now, I am in envy…i wish i could get a hold of her books locally. Oh well. Soon enough I will get a copy of her books. Another wonderful thing, I think i just discovered a few more books to check out from this interview. I also love the idea that the wordless picture books were meant to look less digital…as they do. At point i feel they were done like the old picture books…it has that feel to it. my first visit to this lovely site. thanks for a wonderful interview with Suzy Lee. looking now for her website! I am a brazilian and just start make books for children, and this post inspired me a lot!